Greenkeepers and turf managers are under ever increasing scrutiny to record and justify every spray application. Good spray record keeping is also an essential element of evaluating results - and assessing what worked effectively to make more pro-active decisions in the future. New mobile phone technology opens the opportunity for more sophisticated and readily accessible spray recommendation information, accurate application advice and detailed record keeping. 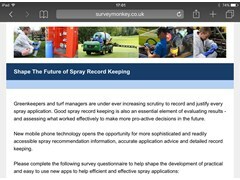 By completing a short survey questionnaire you could help to shape the development of practical and easy to use new apps to help efficient and effective spray applications.